Experienced, qualified natural therapist Shayne Sullivan uses a combination of massage therapy, dry needling and neurolinguistic programming to treat physical pain and injuries, and assist her patients to achieve a positive outlook that boosts their well-being. With a mantra of: “Live life, don’t just exist”, Shayne draws on her wealth of experience in a number of natural therapies to help people maximise their potential in every aspect of their lives. Therapies conducted by Shayne include myotherapy, Emmett technique, Bowen therapy, dry needling, lymphatic drainage, and remedial massage. As a former teacher, Shayne also has a passion for education and is an anatomy and physiology instructor at the Victorian Fitness Academy. 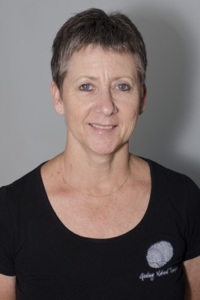 She is also currently a provider for WorkCover, the Department of Aged and Disability Services, the Commonwealth Carer Respite Program, Barwon Health Mental Health, the Pastoral Healthcare Network Australia and St Laurence Community Options. Shayne also hosts the TLS (Tender Loving Care) Clinic at Geelong Natural Therapies. The clinic is run by Pastoral Healthcare Network Australia (PHNA) once a month for people who cannot afford regular treatments or are lonely, need support after a difficult time and need to reconnect with others. It is non-denominational and offers afternoon tea, hand and foot massage, blood pressure readings and Bowen therapy/myotherapy for $10. See available appointments with Shayne via our online booking system.